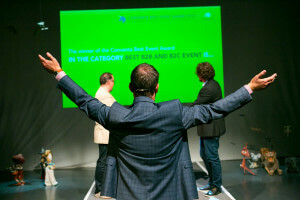 “There were also the Conventa Crossover Awards. Traditionally, this kills the dynamics of every conference: there were 16 finalists, who all had to be given the opportunity to pitch. The initial, but rather traditional idea was to allow them all 10 minutes. This would have lead to 2 (!) hours of pitching, which wouldn’t have been fair to anyone.